For rendering of 3D scalar fields, see Volume rendering. 3D rendering is the 3D computer graphics process of automatically converting 3D wire frame models into 2D images on a computer. 3D renders may include photorealistic effects or non-photorealistic rendering. A screenshot from Second Life, an example of an old online virtual world, which renders frames in real time. Rendering for interactive media, such as games and simulations, is calculated and displayed in real time, at rates of approximately 20 to 120 frames per second. In real-time rendering, the goal is to show as much information as possible as the eye can process in a fraction of a second (a.k.a. "in one frame": In the case of a 30 frame-per-second animation, a frame encompasses one 30th of a second). The primary goal is to achieve an as high as possible degree of photorealism at an acceptable minimum rendering speed (usually 24 frames per second, as that is the minimum the human eye needs to see to successfully create the illusion of movement). In fact, exploitations can be applied in the way the eye 'perceives' the world, and as a result, the final image presented is not necessarily that of the real world, but one close enough for the human eye to tolerate. Rendering software may simulate such visual effects as lens flares, depth of field or motion blur. These are attempts to simulate visual phenomena resulting from the optical characteristics of cameras and of the human eye. These effects can lend an element of realism to a scene, even if the effect is merely a simulated artifact of a camera. This is the basic method employed in games, interactive worlds and VRML. The rapid increase in computer processing power has allowed a progressively higher degree of realism even for real-time rendering, including techniques such as HDR rendering. Real-time rendering is often polygonal and aided by the computer's GPU. Computer-generated image created by Gilles Tran. 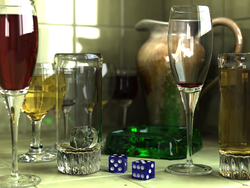 When the goal is photo-realism, techniques such as ray tracing, path tracing, photon mapping or radiosity are employed. This is the basic method employed in digital media and artistic works. Techniques have been developed for the purpose of simulating other naturally occurring effects, such as the interaction of light with various forms of matter. Examples of such techniques include particle systems (which can simulate rain, smoke, or fire), volumetric sampling (to simulate fog, dust and other spatial atmospheric effects), caustics (to simulate light focusing by uneven light-refracting surfaces, such as the light ripples seen on the bottom of a swimming pool), and subsurface scattering (to simulate light reflecting inside the volumes of solid objects such as human skin). Reflection or scattering is the relationship between the incoming and outgoing illumination at a given point. Descriptions of scattering are usually given in terms of a bidirectional scattering distribution function or BSDF. Shading addresses how different types of scattering are distributed across the surface (i.e., which scattering function applies where). Descriptions of this kind are typically expressed with a program called a shader. (Note that there is some confusion since the word "shader" is sometimes used for programs that describe local geometric variation.) A simple example of shading is texture mapping, which uses an image to specify the diffuse color at each point on a surface, giving it more apparent detail. The shaded three-dimensional objects must be flattened so that the display device - namely a monitor - can display it in only two dimensions, this process is called 3D projection. This is done using projection and, for most applications, perspective projection. The basic idea behind perspective projection is that objects that are further away are made smaller in relation to those that are closer to the eye. Programs produce perspective by multiplying a dilation constant raised to the power of the negative of the distance from the observer. A dilation constant of one means that there is no perspective. High dilation constants can cause a "fish-eye" effect in which image distortion begins to occur. Orthographic projection is used mainly in CAD or CAM applications where scientific modeling requires precise measurements and preservation of the third dimension. ^ Badler, Norman I. "3D Object Modeling Lecture Series" (PDF). University of North Carolina at Chapel Hill. ^ "Non-Photorealistic Rendering". Duke University. Retrieved 2018-07-23. ^ "The Science of 3D Rendering". The Institute for Digital Archaeology. Retrieved 2019-01-19. ^ Christensen, Per H.; Jarosz, Wojciech. "The Path to Path-Traced Movies" (PDF). 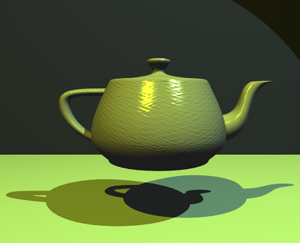 ^ "Fundamentals of Rendering - Reflectance Functions" (PDF). Ohio State University. ^ "Bump Mapping". web.cs.wpi.edu. Retrieved 2018-07-23.